Phone Amego flashes up a semi-transparent status window with the callers name and image from your Address Book if any. To open the corresponding contact in your Address Book, click on the callers image. To refuse an incoming call, press End Call (the red hang up button). This will generally send the caller to your voice mail depending on your phone service. Use Close to close the window (or optionally minimize it on to your Dock) without rejecting the call. The Action menu (bottom right) provides additional options. Clicking the rolodex card icon (Control-Shift-N) will open a contact card for this caller allowing you to update any information or keep notes as desired. The card will open with the cursor positioned to begin typing a note. When you are done typing, you can press Enter to save your note and close the window. This allows you to add notes at any time during a call without needing to remove your hands from the keyboard. The card icon will appear in color if there are previous notes for this caller. Phone Amego uses an open database allowing these cards to be synchronized automatically with other computers using Dropbox. Anyone who answers a call can add notes which become available to other users the next time this person calls. The most general way to dial is to select a phone number that appears on your screen and press Command-Shift-2. This works almost anywhere including spreadsheets, Mail, Outlook, etc. The Hot Key is configurable if needed. If you select a phone number including an extension, Phone Amego will dial the number, wait for the call to connect, and then dial the extension (e.g. 1 (234) 567-8901 x345) if your phone supports this. You can use the Call window (Control-Shift-C) to find a number by typing the first few letters of the persons name. To place a call from your Address Book, click and hold over the label for the desired phone number. When the menu appears, select Dial with Phone Amego. Phone Amego will display a semi-transparent window showing the status of your outgoing call. To cancel, press End Call. If you are connected to a phone tree (e.g. press 1 for sales, 2 for service), you can press the keypad button to reveal a slide-out telephone keypad and send touch-tones by typing the corresponding digits or clicking them on the keypad. If you are redialing or returning a recent call, you can select the corresponding Name or Number from the Recent submenu. Phone Amego normally appears as a status bar item with a pull-down menu. An optional Tool Tip affords quick access to key telephone information. 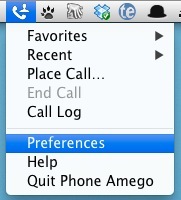 Selecting Preferences from the status bar menu opens the main Phone Amego window. Most of the controls are self explanatory.